Our spacious condo is nestled in the Hidden Village neighborhood, conveniently located between Town Center and Mountain Village. This 4 bedroom, 2.5 bath unit sleeps 11 comfortably, with ample space in the living, dining and kitchen areas. It is the perfect retreat for your family and friends! The kitchen is well equipped with all appliances, dish-ware and cook-ware. Grill out on the balcony while enjoying beautiful views of the mountains! Washer and dryer are in the unit, and there is access to a community pool and hot tub. We enjoyed staying at the property very much. 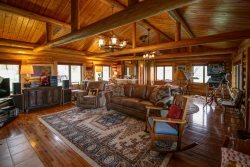 The property was very spacious and quite convenient to Big Sky Resort. The only aspect of the rental that I didn't appreciate was the significant cleaning fee that was associated with the rental. We left the property in good condition and the time it would have taken to clean the condo for the next visitors would have been 2 hours. A $250+ fee for cleaning was clearly exorbitant and was nearly a deal-breaker when we were looking for a place to rent.